There is such a wide variety of strikingly beautiful and colourful natural beauty spread out around the world. 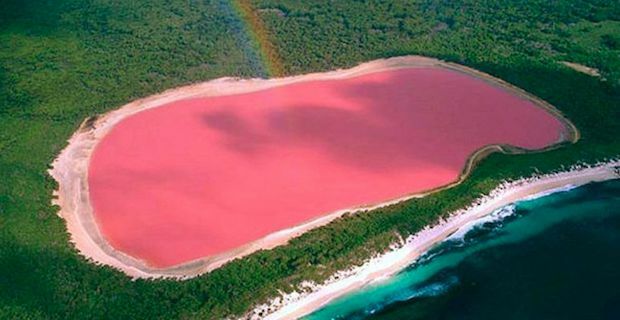 One colour that stands out though from the deep blue oceans and the lush green woodlands is the bubble gum pink lakes dotted around the globe. Australia is home to a few of these pink gems. One of the most famous is on the Middle Island of Recherche Archipelago, Lake Hillier. Lying in western Australia this little lake reaches only 600 metres wide and is surrounded by rich vegetation. 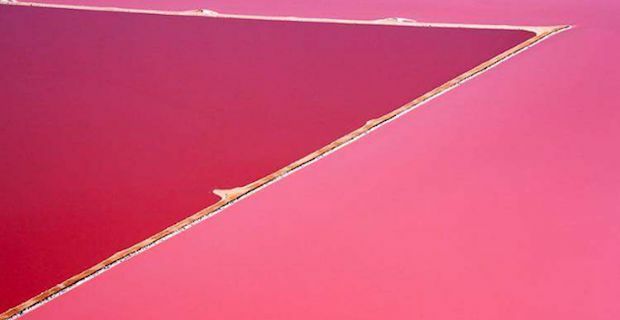 There is no confirmed reason as to why this lake turns pink but scientists believe it may have to do with the dye that comes from various bacteria living in the salt crusts. There is also a high algae concentration in the water that makes it look more pink depending on the amount of sunlight that hits it. 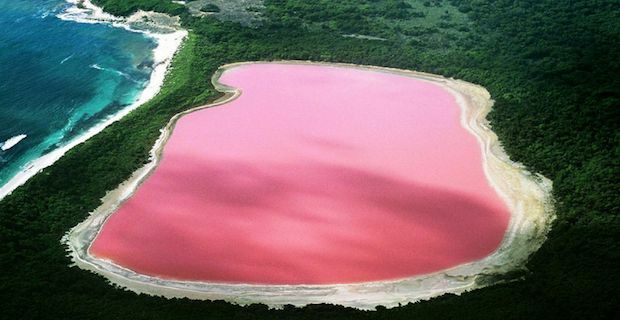 2 other pink bodies of water in Australia are Pink Lake and Hutt Lagoon. Pink Lake gets its color due to the alga, halobacterium and prawns. The sand around the lake also offers lighter shades of pink making it an unforgettable sight. 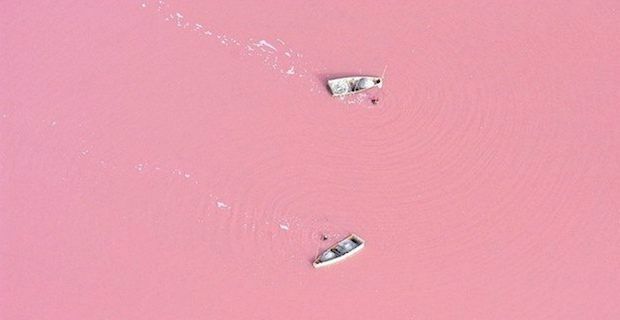 Hutt Lagoon in western Australia also is pink due to the algae in the saline water which it receives from the ocean nearby. Lake Retba (Lac Rose) is in Cap Vert peninsula of Senegal. This lake has an extremely high salinity level reaching around 40% of salt content, similar to that of the Dead Sea, which can be fun to float in, but is very hard on the skin. Mixed with proper lighting, warm temperatures and high enough salinity levels, the Dunaliella salina algae gets a red pigment, beta carotene. During the dry season the local salt harvesters become little spots in the sea of bubblegum. Most of the salt harvested is then used for food products and cosmetics. Canada also have their own pink lake called, Dust Rose Lake, located in British Columbia. This still remains somewhat of a mystery as to how it becomes pink as there is no saline nor algae formation. Some believe that when nearby glaciers melt, they collect various minerals and sediments on the way to the lake transforming it into a little pink lake. 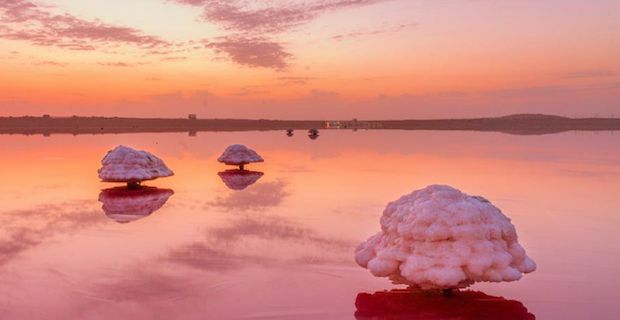 There is also Salinas de Torrevieja or the Salt Pans of Torrevieja in southwest Spain that has a pink lake and is part of a national park that is rich in flora and fauna and migratory birds. Masazir Lake in Azerbaijan is another place that is pink due to the high salt levels. This lake produces over a million tons of salt every year.